they developed an internal logic quite divorced from market realities. the profession back toward reality. Mr. Fox argues, echoing Mr.
in shaping how the country thought and acted in the last 30-plus years. to say they shouldn’t be asked. There's more. And it's a really good column. So check it out. Anyway, the column went up online last night. I knew it was coming, so I checked the NYT Website every half hour or so until it showed up. 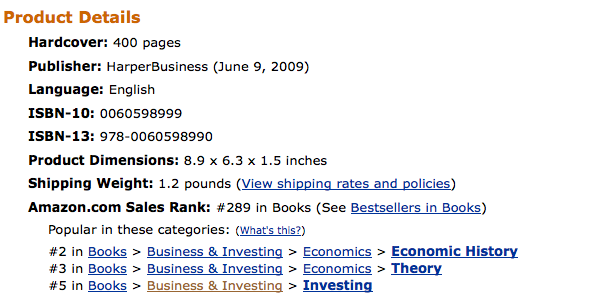 I also checked my Amazon.com ranking a couple of times. It was in 5,000-6,000 territory. This morning we checked Amazon again (my wife and son do most of the checking). The book was on the move. It broke 1,000 around midday. Right now it's at 289—and it's not on sale yet. I'd say Joe writes an influential column.